Sodium hydroxide is also known as caustic soda or lye. The chemical formula is NaOH. It exists as solid crystals but is most often dissolved in water. In this dissolved form, it is a base with a pH above seven. Caustic soda has a wide range of industrial applications. It is used as a raw material in manufacturing processes, often to make everyday products like paper, aluminum and detergents. Other industries like explosives and the petroleum sector use NaOH as a raw material. The energy sector is a growing user of caustic soda in the manufacture of fuel cells. Sodium hydroxide is the most common base found in chemical laboratories. Commercial buildings and cleaning contractors use large quantities of drain cleaner containing NaOH. Caustic soda is very dangerous. Everyone who handles and stores it must understand its hazards. Sodium hydroxide is a highly corrosive chemical. Its fumes are toxic to humans and can even result in death. Caustic soda irritates the skin and eyes in low concentrations. Higher concentrations are more dangerous. It attacks any mucous membranes it contacts. NaOH exposure causes severe respiratory tract and lung damage. Always use appropriate Personal Protective Equipment (PPE) when handling. Because its vapors are toxic, sodium hydroxide storage should be well-ventilated. Secure storage buildings to prevent unauthorized access. Never allow untrained personnel access to caustic soda. Caustic soda crystallizes at low temperatures. Keep storage temperatures controlled in the range 85 F to 100 F (29 C to 38 C). If the temperature drops below 65 F (16 C), the viscosity of the product increases, which may affect its performance. U.S. Chemical Storage supplies non fire-rated CHEMloc chemical storage buildings as a safe option for sodium hydroxide storage. Mechanical ventilation or gravity air flow vents provide constant air circulation and protection from the buildup of harmful fumes. U.S. Chemical offers coatings that are resistant to vapors of corrosives such as sodium hydroxide in stored conditions. The corrosive nature of NaOH requires chemical storage buildings with secondary containment. A failure of the primary container will lead to a spill inside the storage building. CHEMloc buildings feature leakproof spill containment sump. This ensures spills can be captured to prevent groundwater contamination. Safe sodium hydroxide storage is critical for employee safety and to prevent fines. 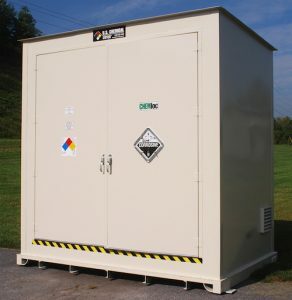 U.S. Chemical Storage CHEMLoc storage buildings are compliant with all regulatory standards. Find out more about our chemical storage building options here.